Clachtoll Broch is one of the most spectacular Iron Age settlements in NW Scotland and is located on the north west coast of Assynt. It is situated near the sandy beach at Clachtoll, the wall of this monumental roundhouse still stands to over 3m in height in places. From our Highland Guesthouse it is only 2 miles drive to the south, in the direction of Lochinver. Brochs were numerous and widespread in the north and west in Iron Age Scotland, and were being built in some places by around 500 BC. 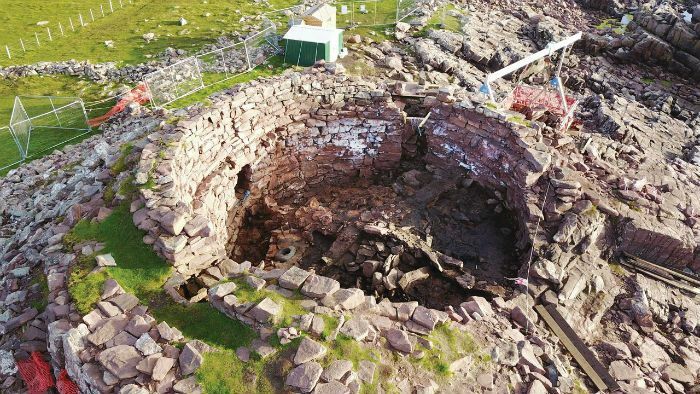 This is a short documentary about Clachtoll Broch. It was made as an educational and easy to follow record of what the archeologists have found at the broch in terms of knowledge from the past and artefacts.